We just learned about the Brooks Range. Another group of mountains in the Laramide Belt in the North American Cordillera is the Rocky Mountains. The "Rockies" are a group of mountains that go all the way from the Canadian provinces of British Columbia and Alberta, through the US states of Montana, Idaho, Wyoming, Utah, Colorado, and New Mexico. The name of the rockies comes from the Native American name, meaning "when seen from across the prairies they looked like a rocky mass". 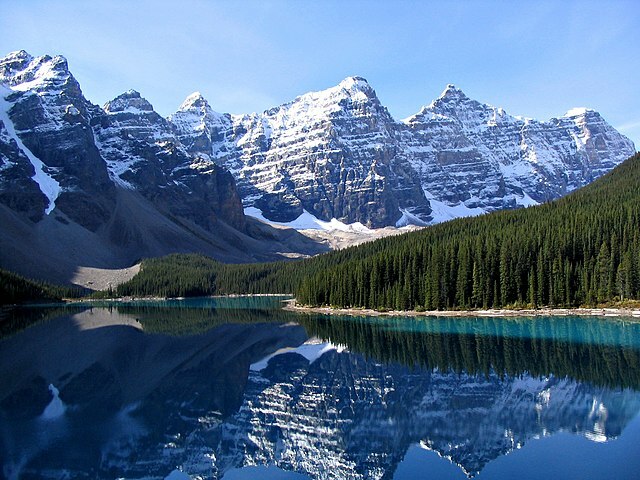 There are many famous mountain areas in the Rockies, like the Valley of the Ten Peaks in Banff National Park in Alberta Canada. The Flatirons in Colorado, where the flatiron type mountains make a triangular steep shape.